Sunday in deep afternoon in a coffee place in a small town in the middle of nowhere, surrounded by highway. Not that that makes that much of a difference. It doesn’t matter. These coffee places spring up everywhere and nowhere. That is their, for lack of a better word, charm. These coffee places are – this coffee place is full of people who don’t stay long; they come and go in perfect turnover, replacing each other like a low shuffling tide. The uniforms for the employees… they are supposed to be able to wear them home, on the bus, to the mall, on the way from school without arousing the notice, suspicion or contempt of others. That’s not a lie, really, but it’s just not true, either. You can spot them easily, pick them from the crowd so fast, when they do any of that. Actually, most of the employees at these coffee places are not fresh-faced teens but people about the exact age and build of my mom. My mom could be working here, and probably yours as well. A lot of moms like our moms work here. They repeat orders dutifully to make sure they got them right, and then go out back when it’s time for their break. There is an Indian family sitting near the door, eating from Tupperware filled with food from home. No one is bothering them about it (as long as they eat fast and somewhat furtively); they have already bought their coffee. A trio of teens, draped in fading black t-shirts and determined sneers, plop down into their hard plastic seats, hands full of donuts and extra-large something-somethings. They sing along with songs they say they hate. (It is obvious they will be back here later, if they can’t get a ride out tonight). Dog-eared newspapers can be found here and there, brought in by people from the outside. They are the only thing people seem to read in these coffee places. There is an old man sitting next to me, thumbing through a section of newspaper. He stops to scratch his beard. He finds the Sudoku and does it with his finger. I have a pen in my bag, but I do not offer it to him. 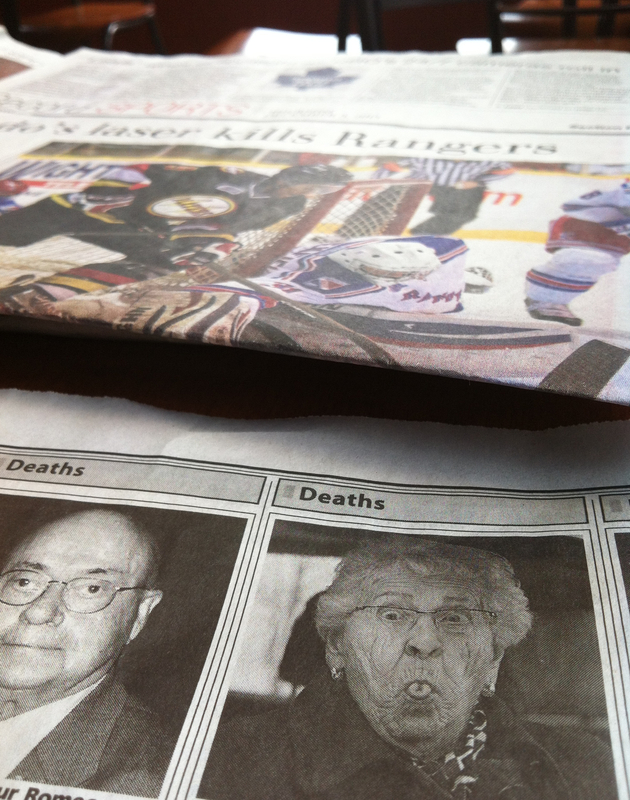 I read the obituaries until my coffee gets cold, which seems faster than can honestly be expected.